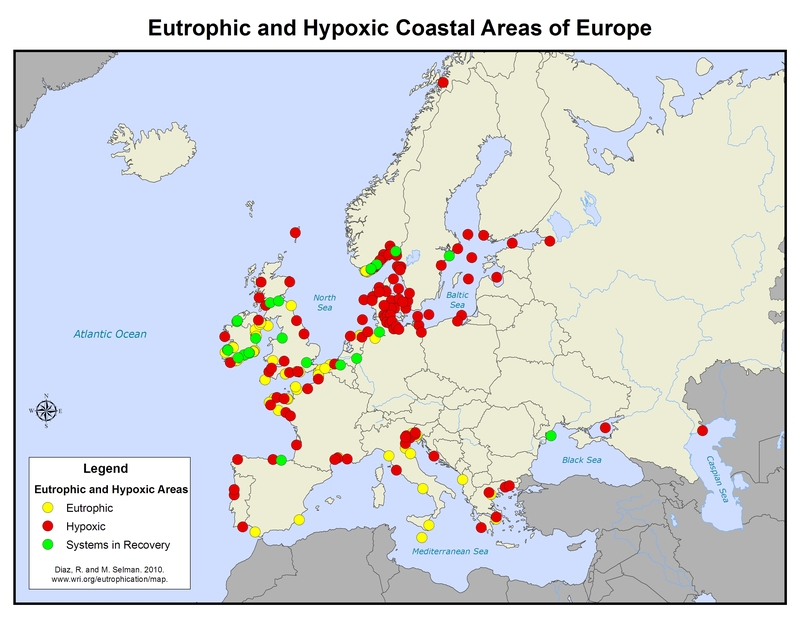 This map identifies 168 eutrophic and hypoxic coastal areas in Europe. Fifty-nine of these are documented hypoxic areas, 106 are areas of concern, and 3 are improved systems that are in recovery. Although relatively comprehensive geographically thanks to multinational surveys such as those carried out by the Commission for the Protection of the Marine Environment of the North-East Atlantic (OSPAR), coordinated eutrophication assessment is still hampered by inconsistent reporting methods between countries and sometimes inconclusive data for determining eutrophic status. It is worth noting the substantial ecological improvements made in the Black Sea, which was formerly one of the most notorious hypoxic areas but is now in recovery.